It seems like nowadays, we start seeing Christmas items sneak into stores by the end of summer! This certainly takes some of the joy out of the season. If you're already burned out, here are a few ways to slowly bring Christmas into your home. Poinsettias: There's no other plant that is so immediately identifiable as Christmas. Just by bringing one into the home or sending one to a friend, these gorgeous plants can bring the holidays indoors and get everyone in the mood. Slide it into a vintage pot or unusual container to give it an even more unique look! Tablescape: Any sort of tray or mirror, with a few assorted candlesticks, several small vases with a single bloom in each one, and ornament balls of varying size and design is an almost effortless way to create a coffee-table focal point with items you likely have around the house! Extra Christmas Greens: If you buy a fresh tree, you'll probably have to trim a few branches off the bottom. Don't toss them out! Use to layer your mantlescape, add greenery to flower arrangements, drape your banister, tuck into unexpected places such as drapery tie backs. All of our Cactus Flower locations will sell mixed holiday greens by the pound. If you put up an artificial tree, but love the smell of fresh pine, this is a perfect way to bring it into your home without the mess. Fruit and flowers: There's something about flowers and fruit mixed together that makes for a very festive display. Ruby red pomegranates, bright green pears or mixed apples look wonderful when paired with white flowers. 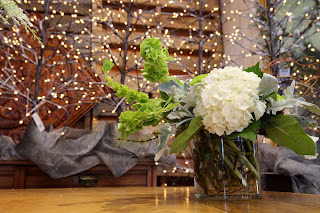 Cluster a white bouquet in a small vase, then place in the center of a larger bowl. Surround with fruit, allowing the flowers to pop up out of the center. Cranberries are another fruit that goes well with floral. Best of all, they float in water. Fill a vase 3/4 full of cranberries, add water to within a few inches of the top, fill with white flowers. 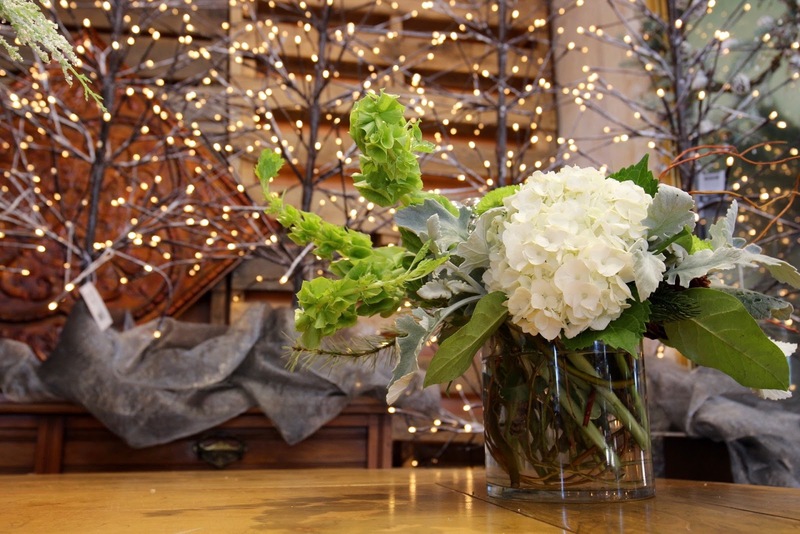 Gorgeous white hydrangea (on sale 5 stems for $10 at any one of our five locations during December!) or white oriental lilies look spectacular against the bright red berries! Arrangements in stockings: Yes, the stockings were hung by the chimney with care...but until Santa swings by to fill them up, they can look a little droopy and sad. Make them joyous and bountiful by carefully placing a tall, slender bouquet inside the stocking. Come into any one of our five locations every Friday afternoon to enjoy 50% off your wrapped bouquet. Ask the designer to create the arrangement inside a plastic to-go bouquet holder which will keep the flowers on a water source without weighing the stocking down. Flowers pop out of the top of the stocking, bringing a festive bit of color and a nice focal point. Flowers in trees: Early one December several years ago we had a customer order 20 packages of baby's breath...that's 200 stems! She let us know that she had seen something in a magazine and just had to try it. Her 10 foot tall tree was decked out in pink lights, and then stems of baby breath were tucked into the branches. When she brought in pictures, we were all stunned by how beautiful something so simple could be. Frozen florals: This is a pretty and unusual way to keep liquor chilled at your holiday party. You'll need an empty 1/2 gallon waxed cardboard milk carton, an empty liquor bottle and fresh flowers, slices of citrus fruit, small springs of pine. Spray the outside of the empty liquor bottle with a non stick spray such as Pam, then place in the center of the empty carton. Place flowers and fruit all around the bottle, stopping before you reach the narrow part of the bottle. Slowly pour in water only up to the widest part of the bottle, then place the entire carton inside the freezer overnight. To use, peel the carton from the ice, then run a bit of water where the bottle meets the ice. This will loosen up the empty bottle--remove it and replace with the full bottle. These look lovely on the bar--just be sure to place the block of ice on a tray that will collect water as it melts.